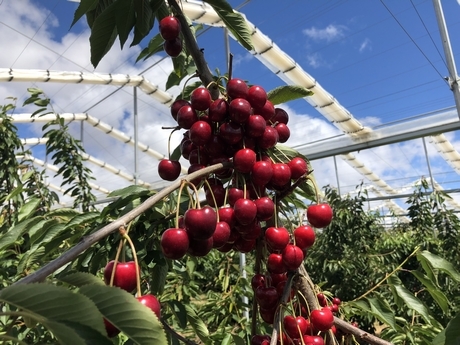 Central Otago based cherry producer Clyde Orchards recently hosted an educational field day under their new 3-hectare Cravo retractable roof X-Frame. 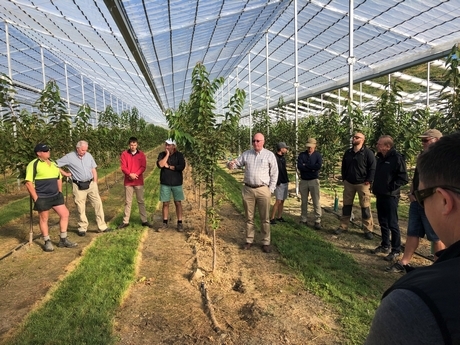 The field day gave leading cherry and berry professionals from across New Zealand, Australia and the UK a chance to connect with both current users and experts of Cravo production systems such as Andrew Hall & Lachlan Allwright from Reid Fruits in Tasmania, and Richard Vollebregt, President of Cravo. Cravo's President Richard Vollebregt talks to attendees. Clyde Orchards owners Kevin and Raymond Paulin told visitors that their recent investment into Cravo retractable roof technology will allow them to harvest several weeks earlier and increase A-grade pack out without any negative impact on fruit firmness. According to Cravo, the highlight of the day was the interaction that occurred between growers. They shared their experiences when growing in the natural outdoors, under traditional rain shelters and automatic retractable orchard covers. - Fruit is firm but can be smaller in size. - Yield is negatively impacted by weather extremes. - Fruit size can be larger than outdoors, but fruit is softer than what is produced outside. - Some varieties experienced higher incidence of foliar disease even though trees were protected from rain. - Extreme heat near harvest time can cause excessive speed of ripening making it difficult to harvest fruit in time. - Fruit size is 2mm larger than outside, fruit is firm and sweet and free from blemishes. - Fruit ripening can be accelerated or delayed depending on control strategy. - Disease and insect pressure are lower than outside. Click the video below if you are interested in a discussion of cherries under an automated retractable orchard cover by Andrew Hall from Reid Fruits in Tasmania Australia.